A V1 missile just before impact. 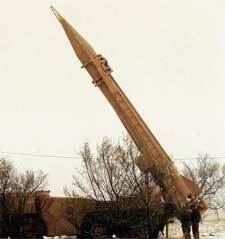 A SCUD missile, which is modeled after von Braun’s V2. 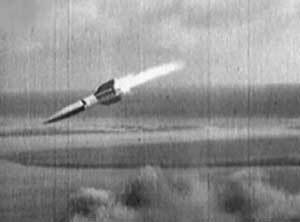 Guided missiles were one of Germany’s most important technical achievements during World War II. Rockets and missiles have been part of warfare since the late 1700s. In 1812, for example, the song The Star Spangled Banner made reference to “the rocket’s red glare.” Throughout the 19th century and into the early 20th, experimenters in many nations hoped to turn simple rockets into weapons or, in some cases, as a way to travel into outer space. At the outbreak of World War II, German experimenter Wernher von Braun and others had already been working toward rockets for space exploration. The German government began supporting rocket research in 1932, believing rockets could be used as weapons, and by 1941 German scientists were testing a missile called the Vergeltungswaffe 1 (Vengeance 1). This missile, developed by engineer Robert Lisserr, used a special kind of jet engine and relied on a mechanical type of “autopilot” for guidance. It was about 29 feet (almost nine meters) in length and weighed almost 5,000 pounds (2,300 kilograms). The V1 was first launched in the summer of 1944, and over the next several months thousands of the missiles were directed toward London. The craft could be seen flying in at low altitudes from a distance of many miles, but they were so fast that anti-aircraft guns could rarely hit them. As they flew, the engines made a distinctive sound, leading the English to call them “buzz bombs.” Allied pilots gradually learned techniques for downing some of the missiles, and with the introduction of artillery shells equipped with the “proximity fuze,” (a tiny radar set on an artillery shell) by late 1944, London was well-protected from V1 buzz bombs. 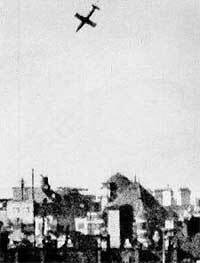 The V2 rocket in flight. There was no defense, however, from the German’s other missile system, the V2. This liquid-fueled rocket had a longer range and a greater payload than the V1. In addition, it traveled much like a modern rocket ship—flying nearly straight up, reaching the border of space, then falling nearly straight down at speeds faster than sound. At the time, there was no way to stop such a missile or even detect its approach. The V2 was based on von Braun’s design and produced at a secret laboratory in Peenemünde and a factory near Nordhausen, both of which used concentration camp prisoners as workers. Beginning in September 1944, the Germans sent thousands of these missiles toward a variety of targets, but most were directed at Antwerp, Belgium and London. The V1 and V2 missiles were not very accurate, but they had a terrorizing effect on civilian populations, which was part of the German strategy. After the war, the V2 rocket became the basis of space and missile programs in Great Britain, the United States, and the Soviet Union. The allied countries grabbed rockets and rocket parts, shipping them home for study along with the German engineers who had designed them. Von Braun continued his research under contract to the U.S government, contributing to both Cold War missile systems and the space race. His counterparts in the Soviet Union did much the same thing. Most of the earliest American unmanned space flights through 1951 were made using modified versions of the V2, and were used for testing and high-altitude research. While major design changes to the V2 led to its abandonment by NASA in the early 1950s, it survives in some form to the present day in the SCUD missile, developed by the Soviet Union and used by Iraq against Israel in the Persian Gulf war of 1990-91.